4 Ingredients Fast, Fresh and Healthy. This exciting cookbook contains over 400 new recipes that are easy to prepare, budget friendly, healthy and above all, mouthwatering! In simple steps, 4 Ingredients Fast, Fresh and Healthy shows you how to use fresh fruit and vegetables, herbs and spices to create tasty meals. You will learn how to take just 4 ingredients, combine them and make delicious pastas, salads, guilt-free desserts and so much more. At last, it is possible to deliver healthy, fresh meals fast! After seven successful years working in the finance industry, in 2007, Kim McCosker, who had the idea for 4 Ingredients, co-authored the cookbook that went on to smash all publishing expectations becoming Australia’s best selling non-fiction book for three successive years and staying in the Neilsen Bookscan Bestseller List for 168 weeks. On top of managing her family commitments as mother of three beautiful boys, Kim works from the 4 Ingredients Office in Caloundra, QLD promoting and developing the phenomenally successful 4 Ingredients brand. Rachael Bermingham is one of the highest selling self-published female authors in Australia. Collectively she has sold over 2.7 million copies of her books in just four years! 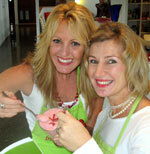 Co-author of the 4 Ingredients series, Rachael is a born entrepreneur and a dynamo at life balance. In addition to managing her successful business interests and upholding family commitments as a proud mum of three boys, she is also a popular motivational speaker and mentor and can regularly be seen and heard on TV and radio programs both nationally and internationally. Bestselling author Deepak Chopra is widely recognized as one of the world's leading authorities in the field of holistic medicine. His belief that the mind, body, and spirit are closely interknit has won him legions of followers. Great book ideal for any cook! This book changed our sons life. He is now a confident cook and enjoys cooking. Thanks so much! Another excellent Four Ingredients book. Well done to the authors. And well done Booktopia for great service, excellent prices and quick delivery. Simple, exactly what I expected. Wanted for gift for not-so-avid cook. Lots of ideas using only the four ingredients and like that it uses healthier options. Very easy to use these books as they only use 4 ingredients but still great dishes. Fundamental, good cooking and eating. This book contains easy to follow and easy to provision for recipes. All very good but connot understand why there are no red meat recipes. Written by Rachael Bermingham and Kim McCosker, these bestselling cookbooks are jam packed full of quick, easy and very delicious recipes that you can easily whip up to WOW your friends and family, and ALL with only 4 or fewer ingredients. You won't need to spend a fortune in measuring utensils. To use 4 Ingredients all you will need is 1 cup, 1 teaspoon and 1 tablespoon - it's cooking made real easy! There are fantastic recipes for breakfast to dinner, entrees to desserts and lunchbox delights. You will be super surprised and delighted with the fantastic dishes you can create using this easy to follow cookbook AND with ingredients mainly already found in your pantry! If you are a busy person, or on a tight budget, have moved out of home, are still fine tuning your culinary skills, are going camping, are on the move and haven't a lot of room for a full pantry, OR you simply haven't had time to do the groceries, then this is the book for you! The BESTSELLING COOKBOOK in AUSTRALIA with over 2 million copies sold! Rachael Bermingham is the highest selling self-published female author in Australia. Collectively she has sold over 2.5 million copies of her books in just 3 years! A born entrepreneur, her professional career commenced at age 19 when she opened her first business (a hair salon) before taking on an assortment of exciting careers including diving, shark feeding and travel consultancy. However her passion for helping others to succeed and transform their goals into achievements took over and Rachael began her career as an author and motivational speaker. Her talent for growing businesses from a $0 turnover to a multi-million dollar turnover from her home office using low cost (sometimes no cost) marketing strategies while juggling family commitments is now well documented. Her time management and effective goal setting strategies have lead her to become a popular trainer and mentor to women in six countries, as well as one of Australia’s most inspiring keynote speakers. A spirited, energetic and enthusiastic mum, she co-wrote and self-published her 1st book ‘Read My Lips’ (a motivational book for women on how to achieve their goals) while breastfeeding her son Jaxson, co-wrote her 2nd book ‘4 Ingredients’ during his day sleep times and has co-written her 3rd book ‘4 Ingredients 2’ during his night sleeps! Rachael has just launched her 4th book ‘How to write your own book & make it BESTSELLER’ and 5th book 4 Ingredients Gluten Free. In addition, Rachael also still successfully manages 4 Ingredients, Read My Lips, and Sunshine Coast Speakers from her home office and has just been shortlisted and is in the running to become a Queensland finalist at this year’s Telstra Business Women’s Awards. A proud Mum to Jaxson 4, and step mum to Lee 20, and Teri 19, Rachael is a dynamo at life balance, fitting all her business commitments snugly in and around her family commitments. Through her honesty in sharing her own story as well as her generosity in imparting her knowledge and strategies for moving forward, Rachael is continually inspiring and motivating others to achieve success. Rachael is on the Today Show each month with Kim, Cameron & Layla, has been featured on various TV programs including A Current Affair, Sunrise, Today Tonight, Mornings with Kerri-Anne, The Great South East and Brisbane Extra as well as numerous magazines and radio programs including the Alan Jones Show on Sydney’s 2GB, Nova, 4BC, ABC and more. She is an incredible role model successfully balancing her personal and professional life by utilising strategies and actions she advocates and is an exciting and entertaining speaker that adds real value and WOW to any event. Kim McCosker was born in Stanthorpe and raised there until moving to Mundubbera, Queensland a fantastic little town where many of her wonderful family and friends still live. Schooled on the Gold Coast, Kim attended Star of the Sea Catholic High School and Griffith University, completing a degree in International Finance in 1998. Kim trained with MLC as a Financial Planner completing her Diploma in Financial Planning through Deakin University in 2000. Kim’s natural ease with people, her ability to communicate effortlessly and her home grown, country confidence served her extremely well as a successful financial adviser and later as the Queensland State Manager of MLC Private Client Services. After the birth of her second child Kim resigned and decided to contract from home writing financial plans. It was during this phase of her life that 4 Ingredients was brought into a reality. Kim had the idea, but it was at the insistence of her life long friend Rachael Bermingham that they write the book ... And so over a couple of red wines began the wonderful rollercoaster ride 4 Ingredients would go on to become! Taking a year to compile and cook, 4 Ingredients (or Kim’s fourth child as she lovingly refers to it) was launched on the 14th March, 2007. From an initial print run of 2,000 that was deemed “Over ambitious in a market saturated with cookbooks” Kim and Rachael went on to orchestrate what the trade now refers to simply as “An Absolute Phenomenon!” Not only was 4 ingredients one of the biggest selling titles in both Australia and New Zealand for 2007 but it was THE BIGGEST SELLING BOOK in Australia for 2008! On the back of the extraordinary success of the book, Kim and Rachael have now filmed two TV series also titled ‘4 Ingredients’ for the Lifestyle Channel. Have launched a very clever application in iTunes that allows you to down load the book to your iphone, smart phone or ipod. Are about to launch their own cookware range in all major department stores across Australia, which they can’t wait to stock in their own kitchens, and have just returned from an extremely successful book launch into the UK and Irish markets. In addition to this, over the past 8 years Glen and Kim have bought and renovated several properties, including a beautiful 1957 Anglican Church, a beachside shack, and the current property they now live in on the Sunshine Coast’s glorious Pelican Waters. Kim maintains the administration, bookwork and finances for their various business and financial interests. Without a sliver of doubt however, the most rewarding of everything accomplished to date has been the birth of her three precious little boys Morgan, 7 Hamilton 4 and Flynn, 1. For Kim, family is THE MOST IMPORTANT thing in the world and carries the greatest priority of all she does! Renovations to properties were done with the children playing in the yard, recipes tested with them mixing and stirring, books written around their sleep times and trips made only when her wonderfully supportive and very loved husband Glen could be home for them. Life presents many opportunities, but having the courage and the time to pursue them, in what is an ever increasingly busy and demanding world, is hard. But Kim is living proof that you can achieve whatever you want in life with exactly that ... HARD WORK.